FGI’s work on benchmarking of terrestrial laser scanning (TLS) methods for forestry applications progresses as planned, and new test datasets have been released in February 2015. More than 10 international groups have already downloaded the test data and more are encouraged to join. The test data can be obtained from the ftp site of the FGI, after sending a request to xinlian.liang@nls.fi or harri.kaartinen@nls.fi. 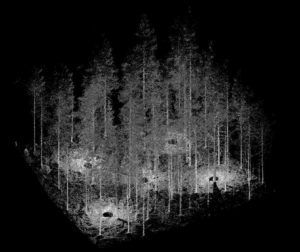 The EuroSDR project on international benchmarking of terrestrial laser scanning methods for forestry applications is coordinated by the Centre of Excellence FGI group. The project was launched in 2014 in order to gain understanding on an optimum data processing technique for future automated forest plot inventories. The objective of the project is to evaluate the quality, accuracy and feasibility of automatic, semi-automatic or manual tree extraction methods based on high-density TLS data. The data is collected in a test forest, a southern Boreal Forest in Evo, Finland. The benchmarking project is targeting on the existing and modified algorithms, and manual measurements from the point cloud data. Meanwhile, the project is also open for all techniques that are in the research phase. National mapping agencies, companies, universities and research organizations are all welcomed to participate in the project and to provide the extracted plotwise parameters. In addition to the final report (in the middle of 2016), joint peer-reviewed journal articles on the statistical comparison results will be prepared. All participants will be invited as co-authors/co-writers in all papers. The distributed data includes one single-scan and one multi-scan dataset for each of the 24 plots. Read more about the data in the project webpage . The TLS data are exclusively used for this project before the publication of the final project report. After that, the point cloud data will be free of use for non-commercial purposes.